J.G. Wentworth Dash For Cash Sweepstakes – Win a $500 Visa gift card! ENTER SWEEPSTAKES HERE – J.G. Wentworth Sweepstakes page. ENTRY LIMIT – Limit of one (1) Entry per person, per email address, per day, throughout the Promotion Period. Limit one (1) Entry per person, per Twitter account, per day, throughout the Promotion Period. HOW TO ENTER – TWITTER: To enter via the Twitter application or website, first “follow” @jgwentworth. Then post a tweet with the $ symbol, along with both the #JGWentworthCashNow and #Sweepstakes hashtags (Each valid tweet will earn one (1) Entry into the Sweepstakes). Limit one (1) Entry per person, per Twitter account, per day, throughout the Promotion Period. 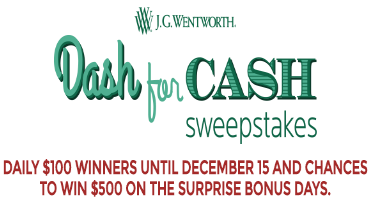 WEBSITE: To enter online, visit http://www.jgwentworth.com/dashforcash (the “Website”) during the Promotion Period or through the J.G. Wentworth Facebook tab to gain access to the registration form, if you have not done so previously. You must completely enter your true and correct information on the official registration form (required fields include: Full Name, Email address and Phone Number). ELIGIBILITY – The Promotion is not open to residents of the state of Maryland, and is open only to legal residents of the remaining forty-nine (49) United States and the District of Columbia, who are at least 18 (except Alabama and Nebraska 19, and 21 in Mississippi) years of age or older at the time of Promotion registration. SWEEPSTAKES ENTRY PERIOD – The Dash for Cash from J.G. Wentworth begins at 12:00:00 PM Eastern Time (“ET”) on November 21, 2016 and ends at 11:59:59 PM ET on December 15, 2016. MovieTickets.com “My Big Fat Greek Wedding 2” Sweepstakes – Win a $500 Visa gift card & more! Win a $500 Visa gift card & more! ENTRY LIMIT – Limit of one (1) entry per person, per email address and per household, regardless of method of entry. ELIGIBILITY – This Sweepstakes is open to any individual who, as of the beginning of the Entry Period (a) is a legal resident of the contiguous Continental United States, including the District of Columbia (specifically excluding Alaska, Hawaii, Rhode Island, Guam, Puerto Rico, and all other U.S. territories and possessions and overseas military installations); (b) is eighteen (18) years of age or older; (c) has access to the Internet; and (d) is a registered user of MovieTickets.com. SWEEPSTAKES ENTRY PERIOD – Sweepstakes entry period begins on March 7, 2016, at 12:00 a.m. Eastern Time (“ET”) and ends on March 27, 2016 at 11:59 p.m. ET. PRIZES – One (1) Grand Prize is available, consisting of (a) one five hundred dollar Visa Gift Card; (b) one (1) set of 4 wine glasses (ARV: $39.96); (c) one (1) cosmetic bag (ARV: $25.00); (d) one (1) Dancing Zorba’s apron (ARV: $35.00); (e) one (1) Dancing Zorba’s mug (ARV: $20.00); (f) one (1) magnetic poetry set (ARV: $15.00); (g) one (1) magnetic frame (ARV: $5.00); (h) one (1) tote bag (ARV: $35.00); (i) one (1) My Big Fat Greek Wedding DVD (ARV: $20.00); and (j) one (1) My Big Fat Greek Wedding 2 shirt (ARV: $20.00). Total ARV of the Grand Prize: $714.96. The Stauffer’s Back to School Sweepstakes – Win a $100 Visa gift card & more! 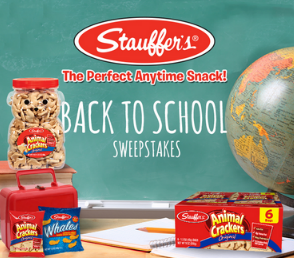 Win a $100 Visa gift card, a year supply of Stauffer’s Animal Crackers and a Back to School prize pack! ENTER SWEEPSTAKES HERE – Stauffer’s Facebook page. ENTRY LIMIT – Limit one (1) sweepstakes entry per person, per email address, per address. ELIGIBILITY – Sweepstakes participation is open only to legal residents of the 50 United States, the District of Columbia and Puerto Rico, who are 18 years of age or older at the time of entry. SWEEPSTAKES ENTRY PERIOD – The Stauffer’s Back to School Sweepstakes begins at 12:00:00 am Eastern Time (“ET”) on August 1, 2015 and ends at 11:59:59 pm ET on August 31, 2015. PRIZES – One (1) Grand Prize and five (5) First Prizes will be awarded. Grand Prize is a one year supply of Stauffer’s Original Animal Crackers, a $100 VISA Gift Card and a Back to School prize pack. Approximate retail value (“ARV”) of Grand Prize: $210. First Prize is Stauffer’s Snack Sample Pack and a $25 VISA Gift Card. ARV of First Prize: $175 each. Philly Pretzel Factory Sweepstakes – Win a $100 Visa gift card! ENTER SWEEPSTAKES HERE – Philly Pretzel Factory Facebook page. ELIGIBILITY – The contest is open only to residents of the United States who are either 18 years of age or older or have parental or guardian consent at the time of entry. SWEEPSTAKES PERIOD – Submission rounds will begin on June 1, 2015 and will end on June 30, 2015. PRIZES – a $100 Visa gift card will be awarded to one winner. 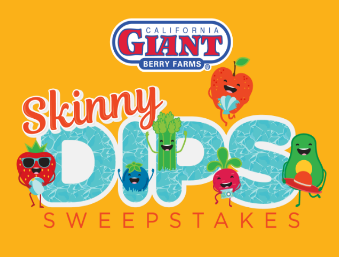 California Giant Berry Farms “Skinny Summertime Sweepstakes” – Win a $1,000 airline voucher & more! Win a $1,000 airline voucher and a $500 Globalhotels.com Gift card! ENTRY LIMIT – There is a limit of one (1) entry per person per e-mail address in each of the Weekly Drawing Periods. District of Columbia and Canada (excluding Puerto Rico, all other US territories and Quebec) who are eighteen (18) years of age or older at time of entry. SWEEPSTAKES PERIOD – The Promotion begins at 12:00:00 AM Pacific Time (“PT”) on May 26, 2015, and ends at 11:59:59 PM PT on July 5, 2015. PRIZES – In each Weekly Drawing Period one (1) winner will be randomly selected to receive a $100.00 USD Visa Gift Card. At the conclusion of the Overall Promotion Period, one (1) winner will be randomly selected from all weekly entries to receive a $1000.00 USD airline voucher and a $500.00 USD Globalhotelcards.com Gift Card. There are six (6) Weekly Drawing Periods and a total of six (6) weekly prizes, plus one (1) grand prize with an overall total value of all prizes $2,100.00 USD. Yonanas Healthy Slam Dunk Sweepstakes – Win a $100 Visa gift card & more! Win a $100 Visa gift card & more! ENTER SWEEPSTAKES HERE – Yonanas Facebook page. ENTRY LIMIT – Limit one (1) entry per person per day for completing a Sweepstakes entry form during the Sweepstakes Submission Period. After completing a Sweepstakes entry form, invite your friends to enter using the respective share button on the entry form’s “Thank You” page. You will receive one (1) additional entry for every valid and original entry Sponsor receives from your shared link. SWEEPSTAKES PERIOD – The Sweepstakes submission period begins on Sunday, March 29, 2015, at 12:00:00 a.m. Eastern Time (“ET”) and ends on Sunday, April 12, 2015, at 11:59:59 p.m. ET. -One (1) Cleveland Cavaliers Autographed Jersey. ARV $100 USD. -One (1) one hundred dollar Visa Gift Card. ARV $100 USD. -One (1) pack of coupons for four (4) free Yonanas 100% Fruit Soft-Serve desserts in Section 228 at the Quicken Loans Arena. ARV $30 USD. 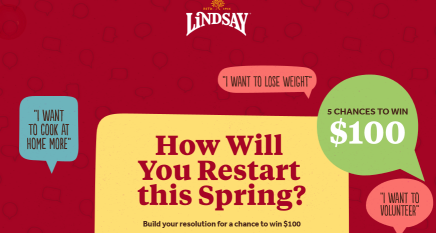 Lindsay Olives “Spring Restarts” Sweepstakes – Win a $100 Visa gift card! Win a $100 Visa gift card (5 winners)! ENTRY LIMIT – Limit of one (1) entry during the Promotion Period. ELIGIBILITY – The Lindsay® “Spring Restart” Sweepstakes is open only to legal residents of the fifty (50) United States (including District of Columbia) who are at least eighteen (18) years old (19 years of age or older for residents of NE and AL) at the time of entry. 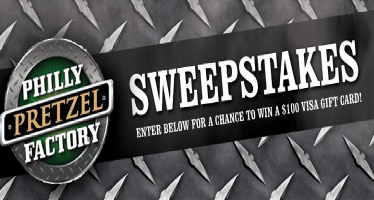 SWEEPSTAKES PERIOD – The Promotion begins on 3/23/2015 at 12:00:01 p.m. Pacific Standard Time (“PST”) and ends on 4/5/2015 at 11:59:59 p.m. PST. PRIZES – FIVE (5) PRIZE WINNERS will be awarded in the form of one (1) $100 Visa® gift card. The Approximate Retail Value (“ARV”) of each of the five prizes is $100.00 USD. 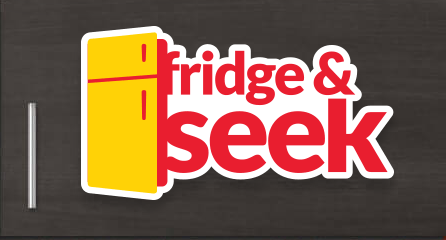 Glad Fridge & Seek Instant Win Game – Win a $250 Visa gift card! Win a $250 Visa gift card (8 winners)! 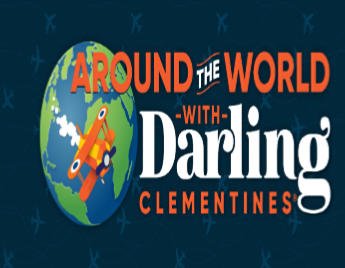 ENTER SWEEPSTAKES HERE – Glad Sweepstakes page. ENTRY LIMIT – Limit: You may play the Instant Win Game as many times per day as you would like but you will only receive one (1) Instant Win Game play per day during the Promotion Period. ELIGIBILITY – Glad Fridge & Seek (the “Instant Win Game”) is open only to legal residents of the fifty (50) United States and the District of Columbia who are at least eighteen (18) years old at the time of entry. SWEEPSTAKES PERIOD – The Instant Win Game begins on January 15, 2015 at 12:00 p.m. Pacific Time (“PT”) and ends on June 30, 2015 at 12:00 p.m. PT. 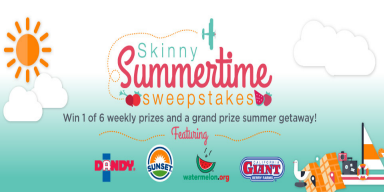 PRIZES – EIGHT (8) GRAND PRIZES: A $250 Visa® gift card. Approximate Retail Value (“ARV”): $250. TWENTY (20) FIRST PRIZES: A $100 Visa® gift card. ARV: $100. TWELVE THOUSAND (12,000) FOURTH PRIZES: A $1 off GLAD products coupon. TWELVE THOUSAND (12,000) FIFTH PRIZES: A $0.50 off GLAD products coupon.